30 students and graduates from RIS countries can get 3-month internships in agri-food sector. The internships will be offered by EIT Food consortium companies or RisingFoodStars companies. Deadline for sending applications: 15th May. 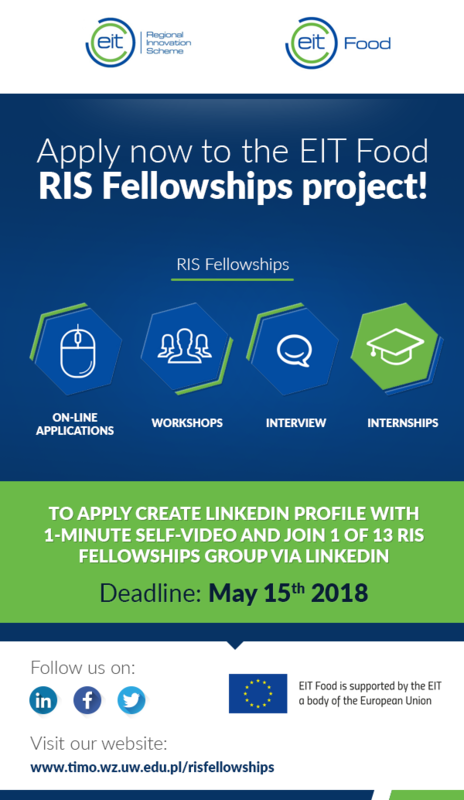 Students and graduates from RIS countries: Croatia, Czech Republic, Estonia, Greece, Hungary, Italy, Lithuania, Poland, Spain, Portugal, Romania, Slovenia and Turkey have an opportunity to take part in a unique and professional internship within framework of RIS Fellowships project. During multi-step recruitment process, candidates will not only learn how to professionally prepare their LinkedIn profile but also will participate in workshops led by EIT Hubs. 30 selected interns will gain hands-on experiences and strengthen their job-related skills, including analytical thinking and creative problem solving. Internships will be provided by EIT Food consortium companies or RisingFoodStars companies. 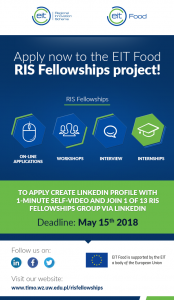 The RIS Fellowships project is organised by the University of Warsaw, AZTI Foundation (Spain), PepsiCo (UK), Puratos (Belgium), Maspex (Poland). In order to join the project one should use LinkedIn social media platform. Deadline for sending applications: 15th May.